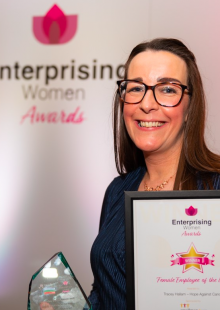 The work of Leicester based charity, Hope Against Cancer, has been recognised once again after winning an award at the Enterprising Women Awards 2019 night. These awards are held for women who go above and beyond to reach the goals of the company/organisation they work for. The night was supported by the East Midlands Chamber, at the Derbyshire County Cricket Club. The short listers attendeda gala dinner and the evening was hosted by Midlands ITV newsreader Sameena Ali-Khan. The night was fittingly held on 8th March which was International Women’s Day. Hope Against Cancer’s Corporate & Events Fundraiser, Tracey Hallam was named ‘Female Employee of the Year’. After joining Hope in 2017, Tracey has made a huge impact by constantly raising the profile of the charity by managing and organising fundraising events which are fully supported by the Leicestershire community. The award winners were chosen from a shortlist of 35 finalists by the Chamber’s judging panel. During the night Tracey also found out that she is a finalist at the ‘Women Who’ Awards in the ‘Women Who Achieve for a Charity’ category. This was announced at the ‘Women Who Achieve’ Network night at Coombe Abbey Hotel, which is where the winner will be announced at the Awards Lunch on Friday 7th June 2019. Tags: Charity and Hope Against Cancer.